Basically, the content type is specified for the whole column with the help of the setColTypes method. As a parameter the method takes a comma-separated list of types' codes. By default, the grid assigns the "ed" type to all columns. Some of the types can be assigned to any type of data in a column. However, there are types (e.g., the 'price' type ) that are assigned only to the cells with numeric values. Otherwise, data will be omitted or parsed incorrectly. A comma-separated list of types' codes must go without spaces. Otherwise, an error will occur. If you need, you may set the type for a specific row or cell using the setCellExcellType and setRowExcellType methods (doesn't matter which type the related column has). In the Standard Edition you can set types of the columns only. In the Professional Edition you can set either the type of the whole column or the type of each cell in it. edn - a column with editable numeric cells that allow formatting values through the setNumberFormat method. A column with simple editable cells. A column with editable text cells that treat data values as plain text, so HTML isn't allowed and any special char must be set without escaping. A column with editable numeric cells that allow you to specify formatting rules through the setNumberFormat method for it. ron - a column with read-only numeric cells that allow formatting values through the setNumberFormat method. A column with simple read-only cells without the possibility to edit the content. A column with read-only numeric cells that treat data values as plain text, so HTML isn't allowed and any special char must be set without escaping. A column with read-only numeric cells that allow formatting values through the setNumberFormat method. txttxt - a column with a multi-line editor that treats data values as plain text, so HTML isn't allowed and any special char must be set without escaping. A simple column with a multiline editor. A column with a multiline editor that treats data values as plain text, so HTML isn't allowed and any special char must be set without escaping. ra_str - a row-oriented radio button. clist - a multi- selection select box. A simple editable select box. A not editable select box. Read more details in the article Managing Select Box Collection. An editable select box presented by DHTMLX combo. Read more information in the article "Integration with dhtmlxCombo". A not editable select box with multiple selection. dhxCalendarA - a date picker with a possibility to input date manually (presented by the DHTMLX calendar). A simple date picker presented by DHTMLX calendar. 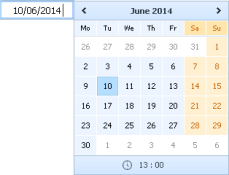 A date picker presented by DHTMLX calendar with a possibility to input date manually. A column that treats data as link sources and renders them as links (analogous to the <a> HTML tag). target - (optional) the target attribute specifying where to open the linked document. _top - opens the link in the full body of the window. A column that treats data as the image source and renders them as images (analogous to the <img> HTML tag). target - (optional) the target attribute specifying where to open the linked page. A column that treats data as price: values < 0 - rendered in green, values > 0 - rendered in red. A column that applies different coloring and marking based on the value. Intended for using with the sales data. An editor uses DHTMLX menu as an editor for a cell. A column that uses DHTMLX tree as an editor for a cell. For details on the setSubTree() method read the related API article. A column that uses DHTMLX grid as an editor for a cell. For details on the setSubGrid() method read the related API article. If API doesn't allow you to provide the desired functionality, you can redefine some method of an editor or create a custom type of content. Read-only editors are used only to describe the way how the incoming data needs to be rendered. The editable eXcells use the same approach as read-only editors do, but with a few additional methods. detach() - ( not declared explicitly, nested from the 'ed' type ) called when the grid is switched back to the normal state. In spite of the fact that we have twice as much rows in this example as we had during the creation of the read-only editor, basically, we have only one row which needs customizing. Both the edit and detach events are fully reused from the already existing excell. As you can see, only the text marked in bold was changed, and now, instead of a useless button we have a value formatted with some postfix. This value can be edited as an Integer value. this.cell.innerHTML = "<input type='text' style='width:50px;'>"
As you can see, this sample contains some additional code, but there is still nothing really complex. HTML code of the editor is defined inside of the edit() method. Thus, the editor is filled with the current values. Values from the editor are combined to get a new cell value inside the detach() method.